For the 1906-1907 program, the immediate successor to Dreadnought and the Invincibles, Fisher was not content to rest on his laurels. He sketched a "fusion" ship, intended to have battleship armor with battlecruiser speed. To keep dimensions reasonable, the design would have only four turrets, one on each end and two en echelon amidships, with the wing turrets being triples. The ship would have displaced 22,500 tons,2 and cost about a third more than her predecessor. This was a good design, but the Liberal victory in the 1905 election moved social spending up the government's priority list, and the three ships bought were near-repeats of Dreadnought, the Bellerophon class. There were only a few major changes, due to time pressures and the desire to keep costs down. Dreadnought's 12pdr secondary guns were replaced by 4"/50s in view of increasing torpedo range and bigger, tougher torpedo boats. The rig was rearranged, with two tripod masts for improved fire control. 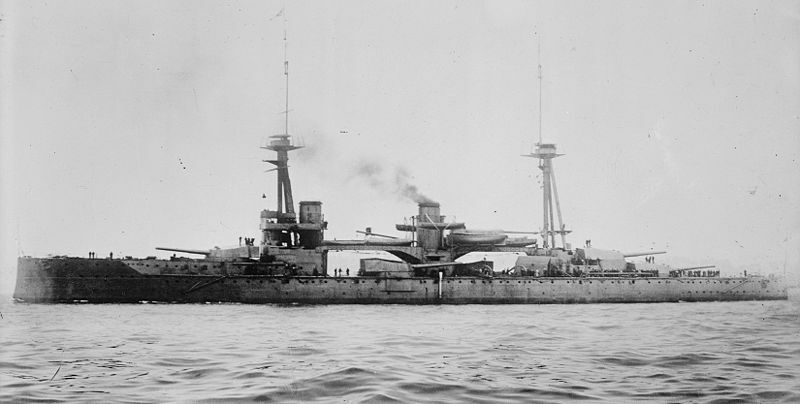 More importantly, the foremast was moved forward of the funnel, taking the top out of the funnel smoke, which had been a persistent problem on Dreadnought. Less visibly, the belt was thinned slightly and underwater protection was improved. The initial plan had been to push the fusion design back a year, to the 1907-1908 program, but this also fell through. The triple turret had fallen out of favor, so an enlarged Bellerophon was built, the St Vincent class. The guns were upgraded from from 12"/45s to 12"/50s,3 and the secondary battery went from 16 to 20 4" guns. On the other side of the Atlantic, the Americans were responding to Dreadnought. They'd already ordered the South Carolina class of all-big-gun ships, but they were slow and small. The next class, the Delawares, were full-fledged battleships, with engines for 21 kts, 14 5"/50 guns protected by casemates, and 10 12" guns. The US continued to eschew wing turrets, which meant that the Delawares were badly cramped for centerline space. The need for fine ends on the hull, to achieve high speed, meant that the designers faced structural problems. One way they resolved this was to make Turret 3 superfiring instead of Turret 4, which kept more weight in the wider part of the hull. A drawback to this was that it meant that Turret 3 couldn't fire straight aft when Turret 4 was trained forward, because of blast effects on the lower turret. Delaware continued the use of reciprocating engines, while North Dakota was the first US battleship to use turbines. They were not terribly popular, as the US was very concerned with range for Pacific operations. The British 1908-1909 program finally saw a departure from Dreadnought's configuration. Neptune had the en echelon wing turrets that had first been introduced in the battlecruisers. In theory, this gave a 10-gun broadside, as well as the 6 guns fore or aft of the previous ships. In practice, blast damage concerns limited the wing turrets when firing on the opposite side. There was a bridge for boat storage over the gap left by the two turrets, which might have fallen and put the wing turrets out of action if damaged. Neptune also saw the first British use of the superfiring turret, although this was primarily to save length, as the ship had been stretched by the staggered wing turrets.4 There was also a new upper armored deck, closing off the top of the belt. The next US dreadnoughts, the Florida class, were visually very similar to the Delawares, and bore about the same resemblance to them as the Bellerophons did to Dreadnought. North Dakota had been built with American-designed Curtis turbines, which were considerably shorter than the British Parsons turbines. The new class was intended to be capable of carrying the Parsons units, so the boilers had to be rearranged, increasing beam. This turned out to be a good thing, as the Delawares were very short on metacentric height. 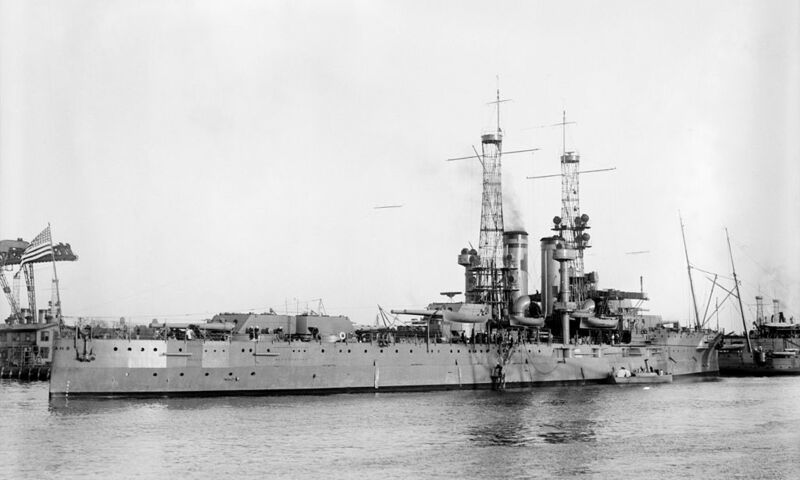 The secondary battery was also upgraded, to the superb 5"/51 that armed American battleships until the 1920s. One notable feature of American dreadnoughts was the cage mast. The US was very interested in long-range combat, but wanted a mast that did not present a large target to enemy fire. The hyperboloid cage mast was made of many redundant elements, each too light to detonate a shell. Any shell hitting the cage mast would merely snip a few elements, while a shell striking a British-style tripod mast would theoretically bring down the fire control top, or at least blast it with fragments. In practice, the British never suffered serious damage to their masts throughout the war, and the US abandoned cage masts in the interwar years. The masts were installed in pairs so that at least one spotting top would always be free of smoke, regardless of which way the wind was blowing. HMS Colossus at Scapa Flow. Note removal of the after boat bridge. On both sides of the Atlantic, navies were looking at increasing gun caliber to fight at the longer ranges that were becoming possible with improved fire control. For reasons explained previously, heavier guns are better at long range. However, both navies hesitated, as going to a larger caliber would drive up the size of the ships,5 and in the eyes of many it would be deliberately obsoleting the existing 12" dreadnoughts, much as Dreadnought had rendered the pre-dreadnoughts obsolete.6 The US built one last class of 12"-gunned ships, the Wyoming class, primarily due to fear of delays associated with going to the 14" guns. These ships were the result of a major change in US design practice, and will be covered with the other second-generation American dreadnoughts. The last British 12" ships were the Colossus class, a pair of ships very similar to Neptune. The main change, for reasons that are completely baffling, was to eliminate the mainmast and move the foremast back behind the funnel, causing the top to be nearly uninhabitable. The 1909-1910 program was originally supposed to be two battleships and one battlecruiser, but British intelligence thought they detected a major increase in the rate of German construction, and a total of eight ships were ordered that year. The other ships were of a later generation, with 13.5" guns and all-centerline turrets, and will be our subject next time. Some time ago the original blueprints (or some of them) for Bellerophon went up for auction, I very nearly bought them and had them framed. I wish both ships had more illustrious careers, though their Trafalgar namesakes certainly both did. I remember you telling me about them a year or so ago. Took me long enough to get to the ships. It might be possible to get a scan of the plans for a comparatively reasonable price through the Royal Maritime Museum. They don’t have an existing one of either of the dreadnoughts scanned, but there’s almost certainly a copy in their archives. Re the Delaware's triple rear turrets, I assume this is to improve the broadside while maintaining decent fore/aft fire. However, given the limited arcs that the Delaware's fourth turret is usable, was it mostly meant to be a redundancy item, or exclusively for broadsides? Also, most of the WWII era ships seem to have had their heavier armament in front (i.e. Iowa has two turrets in front of the superstructure, and one aft, as did the Lion and KGV classes*) while the Neptune/Delaware put their extra turrets aft. Was there a change in theory behind this? So long as they're all centerline turrets, it doesn't impact the broadside, but I guess it changes the emphasis from defensive (I'm being chased) to offensive (I'm chasing). On the other hand, I suppose turrets forwards is also a better defense against having one's T crossed. 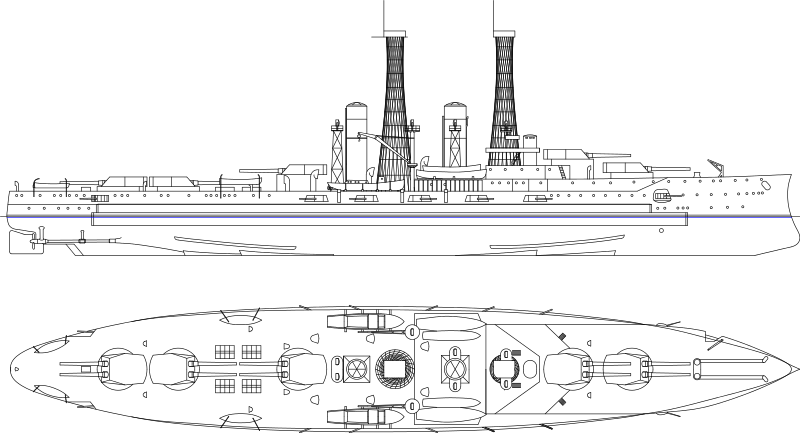 Re the Delaware’s triple rear turrets, I assume this is to improve the broadside while maintaining decent fore/aft fire. However, given the limited arcs that the Delaware’s fourth turret is usable, was it mostly meant to be a redundancy item, or exclusively for broadsides? Exclusively for broadsides. Turret 4 had no ability to fire aft at all, and Turret 3 was pretty limited. The US was big on broadside fire, as I mentioned in the previous post about the South Carolina class. End-on was seen as not that important. Also, most of the WWII era ships seem to have had their heavier armament in front (i.e. Iowa has two turrets in front of the superstructure, and one aft, as did the Lion and KGV classes*) while the Neptune/Delaware put their extra turrets aft. Was there a change in theory behind this? Yes and no. Putting more than two turrets forward is really awkward (NelRod steered weirdly because of how far aft the bridge was, which took some getting used to) and you may run into trouble with seakeeping. The US didn't really care that much about end-on fire, and Neptune's superfiring aft turret couldn't fire within about 30 degrees of the centerline because of blast effects. Later on, most WWII battleships had three turrets, and given the tactical conditions prevailing, it made more sense to put them forward than aft. Chasing was seen as more likely than being chased. The NelRods were an attempt to squeeze as much as possible out of a small hull, and IIRC the British changed their design criteria later on, which is why the layout wasn't repeated. When the US analyzed it under its rules, it turned out to be less efficient than a conventional arrangement for various reasons. (I'll explain this in more detail later, as it's a really interesting case of how different countries made different assumptions.) Richelieu was mostly weight savings, AIUI. I am definitely interested in hearing more about those assumptions -- one usually hears about (some of) the British or US assumptions, and a bit about the Germans, but what about those of other nations? That’s an area I’m rather weak on. Those only come out in the good design histories, which in turn are heavily based on available official records. In cases where those are in a foreign language, inaccessible, and/or destroyed, it’s hard for historians to get a good grasp of what the actual drivers were, and that means there are no books I can consult. I’m trying to do this with my series on the Russian ships (which I promise isn’t dead, just waiting for the main series to catch up) and I have a book that might let me do this for the French. I don’t know of equivalent sources for the Italians, Japanese, or Germans, although I haven’t looked that hard.